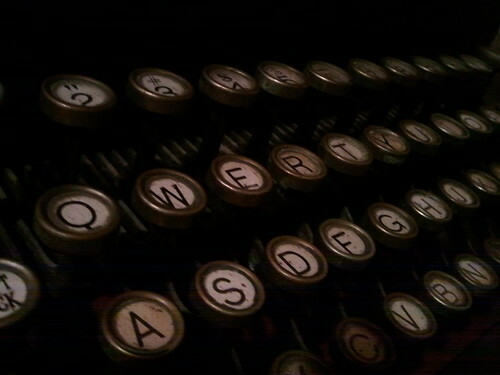 Typewriter, a photo by mikeymckay on Flickr. Blogging is a funny thing. People get into it for all different reasons. I think right up top is a lot of people think they can become millionaires from having the right blog. They see success stories that other people have had or created, like boingboing or gizmodo and they think, “Why not me too?” – and there is some truth to that. Your blog can go viral because of something you write or create and then before you know it you have your own reality show. There’s definitely a disease a lot of people my age have contracted from growing up in front of the TV and during the Internet explosion, not sure what the name of that disease is, but it makes you want people to listen to you and to be popular. I think to an extent, that’s what a lot of people are looking for – and they’ll never get it. Not to be corny, and I’m sorry that this is corny and I know it, but I think you can make yourself feel a little bit better about the whole enterprise if you write on your blog just for yourself, and to express things you have inside you, that maybe will take a life of their own out in the “world”. Like letting a little monster out of a cage that goes on to help someone build a new picket fence without you even knowing it. If that makes any sense. Even though I am trying to take that angle in my blog writing, I am feeling an overwhelming frustration. I admit it. When my stats counter says 10 people have read my blog today, and 3 of them are me in another browser I haven’t logged into, and 7 are a weird URL that I visit and goes to a website that I know is doing something shady with marketing – I get sad. Seeing all the other bloggers out there striving to be read – like ants crawling all over each other to get to a tree branch – I get sad. Although in reality, I think those ants are trying to help one get up to that branch for the greater good, which is kind of nice, in its way. So here I am writing a post and hoping someone might read this and others below it, and feeling like all of us bloggers typing randomly might eventually write all the works of Shakespeare, like those hypothetical monkeys in this blog title. I know what you mean. Sort of. I actually have quite a few people reading my blog, but it’s all family and friends who occasionally want to see what I’m getting up to. You see, I started my blog as a way for family and friends to stay updated on my year abroad. It’s a lot easier than sending out mass emails, because you’re bound to miss many people in those emails. I post everyday, mainly because I made a pact with myself that I wouldn’t miss a day if I could help it. If people get around to reading it great! If they don’t, I don’t sweat it. People are busy. I got to your blog through reading follow-up comments on the post about the distraction-free writing mode. So hey, that’s someone whose not you and not some shady marketing thing. I don’t have time today, but I’m going to check out more of your posts. I like your writing so far and I’m interested in what you have to say. Starting my own blog has helped me realize the importance of reading the blogs of others. Good luck, who knows, maybe you’ll get Freshly Pressed! I never thought I’d care one bit about being read, but then somewhere along the line when I started spending time on it – I became obsessed with the numbers. You are right though, people ARE busy and there are so many other things people can be doing and there are so many blogs out on the Internet. I guess that’s what I was trying to convey with the post – and that in the end – you just have to write for yourself or you won’t be happy with a blog of your own. I also agree about reading what other people write – I think it makes you appreciate the amount of time a good post can take. I will be checking out your blog as well and thanks again. That’s right. Writing for yourself is the best way to look at it and if people read it that’s a plus. I also look at mine as sort of like a journal of my year. I’ll always remember all the big stuff I do, but all the little day to day things, all the cute little stories I can tell about the boys…this blog will be great for looking back. Kind of like a time capsule. I remember looking back on old diaries and even my old Live Journal (which I haven’t used in FOREVER!) and I can see how much I’ve changed, how much I’ve stayed the same.